A softphone is a piece of software that simulates the action of a telephone and allows you to make, receive, and manage voice calls over the internet. Softphones run on computers, tablets, PCs, and smartphones, and are necessary for placing VoIP calls and video calls. They typically take the form of dedicated voice-calling or chat apps, or apps embedded within other sites and services (e.g., Facebook Messenger, Google Hangouts). VoIP stands for Voice over Internet Protocol, or Voice over IP, and refers broadly to the technology that allows voice calls to be made over the internet. An interface that acts as a platform for communication between the user and the computer or device. It usually consists of a graphical pad of numbers similar to a telephone, and in some cases a keyboard to enter names of new contacts and searches. The interface also includes control buttons to manage calls and presentations. It works with audio inputs and outputs available on the softphone device for microphone and speaker functions for calls. An engine for processing calls, with modules in a communication API that allow calls to be placed and received in a particular protocol. A set of codecs that allow voice data to be encoded between analog and digital formats. Codecs also compress the data so that they can easily be transferred over the internet. A contact list to keep track of numbers and names to easily manage correspondents. Softphones have evolved over the years as the VoIP industry has grown. In the early days of VoIP, softphones were replications of the traditional phone over a computer, but have since expanded their functions to include video and other features unavailable to traditional telephones. Softphones differ based on their functionalities, the purpose of their use, the sophistication and complexity of the protocol they are under, and the features offered. For instance, a softphone designed for business purposes is likely to have a bulky interface and a lot of features with rich menus and options, whereas chat apps on smartphones can have very simple interfaces that require only one or two touches of the finger to initiate communications. There are many applications and services for softphones available. Skype is a well-known example of communication software that has softphone functionality incorporated into its interface. Given that Skype users are identified through their usernames and not numbers, the dial pad is not often used. But for SkypeOut calls, a very basic interface allows users to dial the numbers of landlines and mobile devices they are contacting. More sophisticated softphones do not mimic traditional phones; instead, they use other methods of selecting contacts and dialing. For instance, some softphones use voice recognition that lets users say the names of the contact they want to call to initiate the phone call. 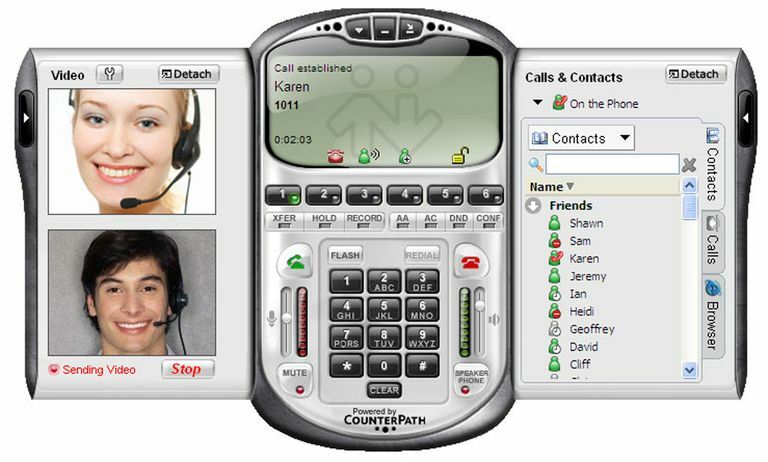 A good example of a business softphone is Counterpath's X-Lite, which is free but full of features. A more enhanced version is the paid Bria. What is a VoIP Client?